According to a survey released today by Integrated Media Measurement Inc., more than 20 percent of people studied watch some amount of prime-time, episodic programming online. 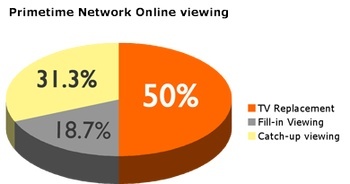 Within that group of online viewers, 50 percent are watching programs as they become available and are starting to use the computer as a substitute for a television. The other 50 percent use the Web to watch programming they’ve missed or to re-watch episodes they have already seen. All of which means . . .
IMMI collected its information by conducting random samples of 3,000 teens and adults in six markets — New York, Denver, Chicago, Los Angeles, Miami, and Houston. Participants were given a cellphone that runs proprietary software that tracks their media consumption. Characteristics of the online TV audience are beginning to emerge. According to IMMI data, the audience skews female (55 percent), is mostly between the ages of 25 to 54 (58.4 percent), are primarily Caucasian (76.8 percent), are more affluent than live network prime-time viewers, and a majority (56.8 percent) have completed four or more years of college.